Special thanks to Peter James Gallacher for his info on the books and his reviews. Blinded in a tragic accident, Matt Murdock discovered that the radioactive isotope responsible for his condition also heightened his other senses, creating an acute awareness of his surroundings that enables him to "see" with more clarity than those with sight can possible imagine. By day, Matt Murdock is an attorney for the downtrodden souls of New York City, fighting the good fight against corrupt political and corporate machines to the fullest extent of the law. By night, Matt Murdock wages a different kind of war. With his heightened senses to guide him through the seedy labyrinth known as Hell's Kitchen, he joins the battle against the criminal underworld in order to dispense justice to those the law cannot touch. Elektra Natchios died, once. But the beautiful, dangerous heiress was resurrected and recruited by a mysterious group who trained Elektra in the art of combat, then cast her out when her anger and lust for vengeance became more than they could bear. Now she works as a paid assassin -- the very best that money can buy, notorious for her lethal speed and precision. Elektra is careful to treat each assignment as just another job, providing a service she can perform better than anyone else. Driven by the rage she has felt ever since her mother's untimely death, Elektra has become the world's most dangerous assassin. After her wise mystical-arts mentor sends her away for her bad attitude, Elektra must take any assignments she can find. But when Kirigi, the leader of a group of ruthless hired guns called the Order of the Hand, sends Elektra to kill a man named Mark Miller and his young daughter, Abby, she decides to befriend and protect the pair instead. Now Elektra must battle the evil ninjas of the Hand while struggling with her own troubled past. Will she be able to defeat Kirigi and save Mark and Abby, or will this change of heart destroy her? DAREDEVIL BATTLES BULLSEYE AS NEW YORK BURNS! An arsonist's twisted handiwork claims hundreds of lives in the roughest neighbourhood in New York-Daredevil's turf. Daredevil digs up the root of the problem and comes up with a ruthless crime boss bent on brutally wrestling control of New York's underworld from the Kingpin of Crime. The new crime boss's enforcer? The bloodthirsty Bullseye, master assassin with a pathological enmity for Daredevil. Bullseye takes to his work with deadly efficiency, killing his way towards the Man Without Fear Daredevil is forced to ask for help from the Kingpin-his deadliest foe-before Bullseye's fatal obsession and an explosive gang war destroy the city he's sworn to protect. A plain and simple good read. Daredevil has always struck me as a character with literary potential. One of the strengths of the comic has always been the rich supporting cast and Golden uses them to the fullest. Karen Page, Ben Urich, Turk, Sister Maggie and Foggy Nelson are all there. The Black Widow also makes an unexpected appearance. Other surprise players are Betsy and Melvin Potter (aka, the Gladiator). Golden's portrayal of the Gladiator is one of the book's high points.The only area in which the book falls seriously short is in the villain department. No, not the Kingpin or Bullseye (they're great...I only wish there was more of them! ), but Gary Wiezak. Who?, you ask. Exactly. Who indeed. I mentioned in my review of What Savage Beast that Golden tackles the continuity problem differently the PAD and the approach directly affects the story...and also leads to Gary Wiezak. Golden states that this story takes place between Daredevil #233 and #234, therefore the reader knows that nothing significant can happen to most of the characters in the story, because we've read about them after Daredevil #234. This makes Gary Wiezak stick out like a sore thumb. The reader knows Wiezak, who is the key antagonist, is going down (and hard) because in the world of comics he's a nobody. Now this might not be so bad if it wasn't for the fact that Wiezak is written as a two-bit loser in waaaay over his head. If Daredevil can't take this guy out he should seriously consider an other profession. Without a strong lead villain, an otherwise well written book suffers. Fortunately the host of other strong characters makes up for Wiezak's deficiencies. Daredevil fans should enjoy the book and consider it worth the cash. 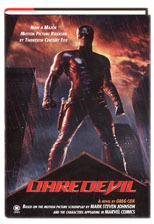 A mysterious marauder called "The Cutter" is murdering innocent people in Hell's Kitchen - Daredevil's turf. But the man without fear may find that this is a foe he cannot face, for the Cutter has been enhanced by a revolutionary new procedure that makes him immune to Daredevil's superhuman senses. This short book reprints the essay previously featured in the "Devil is in the Details" book above. Become Daredevil or Kingpin in this unique adventure book by James Ward. Here Comes... Daredevil! This black and white book reprints classic DD tales. As a collection of four short stories, The Marvel Superheroes has its ups and downs. This black and white book reprints "The Fellowship of Fear" and "The Stilt-Man Cometh! ".